Forged signatures appear on the petition that may have helped former State Rep. Jon Keyser qualify for the U.S. Senate Republican primary ballot. Keyser qualified for the June 28 primary ballot by collecting signatures and petitioning his way onto the ballot. Initially, the Secretary of State determined that Keyser did not meet the required number of signatures because of multiple technical errors. Keyser challenged the decision in court and got the invalidated signatures added back to his total. Denver7 has now confirmed with 10 voters that they did not write their names, addresses and signatures that appear on his petition. The 10 signatures that voters told Denver7 were forged were collected in Congressional District One, where Keyser was credited with 1,520 valid signatures. If he had turned in fewer than 1,500, he would not have qualified for the primary ballot. Congressional District One includes Denver, Englewood, Littleton, Columbine, Ken Caryl, Glendale, Cherry Hills Village and Sheridan. If you're a registered Republican living in those areas, it's possible your name appears on one of these petitions and you don't even know. "The extent of the apparent petition fraud committed by Jon Keyser's campaign uncovered by Denver7 is worse than anything we could have foreseen," said Alan Franklin, director of ProgressNow Colorado, a left-leaning public policy group. "It is increasingly evident that Keyser owes his spot on the 2016 ballot to fraud. Keyser must immediately withdraw from the U.S. Senate race. In addition, action must be taken by appropriate authorities to determine the full extent of this fraud and to prosecute everyone responsible." Keyser petitioned to be on the ballot, as did other Republican Senate candidates, including former Colorado State University Athletic Director Jack Graham and Colorado Springs businessman Robert Blaha. Former Aurora City Councilman Ryan Frazier also petitioned to get on the ballot, but he did not collect enough valid signatures according to the Secretary of State. He challenged that ruling in court, but the judge's ruling did not give him enough valid signatures. He has appealed that decision to the Colorado Supreme Court. The winner of the June 28 primary will take on Sen. Michael Bennet, the Democratic incumbent, in the November general election. On May 3, ProgressNow Colorado discovered a duplicate signature on the petitions for Graham and Keyser. The voter who appeared to sign both petitions is named Pamela Niemczyk. Denver7 met with Niemczyk and she confirmed that her signature was forged on Keyser's petition. Since then, Denver7 political reporter Marshall Zelinger has reviewed signatures on Keyser's petition that were collected by the same signature collector, who supposedly got Niemczyk to sign the petition. We have identified 10 signatures that were not written by the voter whose name appears on the petition. Many more signatures appear to have the same handwriting style and characteristics as the 10 we've already identified as forged. "I think I would question all of the signatures. I mean, if you do it once, what's to keep you from doing it multiple times?" Niemczyk asked. "I would call it fraud. It's fraud. It's definitely fraud. I'm not happy with it." Zelinger found other voters who said their signatures were forged on Keyser's petition. "I would remember if I'd signed a petition for somebody and it's just clearly not the way I sign my name," Denver voter David Keene told Zelinger. Keene's name, address and signature also show up on the petition collected by the same person who turned in Niemczyk's signature. "Did you sign this petition?" asked Zelinger. "I did not. It couldn't be my signature," said Keene. "Nothing's similar about it." "Did you sign that petition?" Zelinger asked Littleton voter Rachel Malcolm. "Is your name on this petition?" asked Zelinger. "It is, but it's spelled incorrectly," she said. "Is it your handwriting?" asked Zelinger. The same woman who turned in signatures from Niemczyk and Keene, also collected the signature for Malcolm. We're only identifying the signature-collector by her first name, Maureen. An apparent spelling mistake also made it by the eyes of those who verify a voter's name and address at the Secretary of State's office. 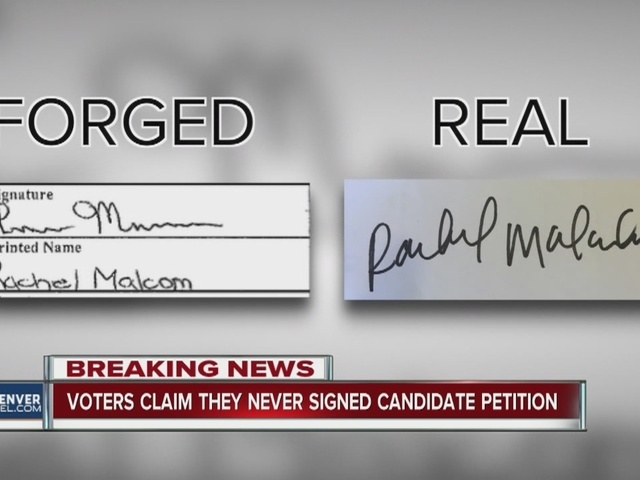 On the petition, voter Rachel Malcolm's last name is misspelled, "Malcom." "First, I don't curl my 'R's' like that, I don't curl my 'M's' like that. There are no 'L's' in the signature, and then, actually, my name's spelled incorrectly," said Malcolm. "I feel violated. I'm more than happy to sign a petition for somebody, but you don't need to do it for me." "Until you walked up to my door, that's the first time I've seen it," said Littleton voter Ray Lacher. "To be clear, did you sign that petition?" asked Zelinger. "No, I didn't," said Lacher. Just like with Malcolm's printed name, Lacher's name is also misspelled. It appears to be spelled correctly in the cursive signature, but the printed name is spelled "Locher." "You haven't signed a petition for any of the candidates to get on ballot?" asked Zelinger. "No, I haven't this year at all," said Lacher. "Someone has forged your signature?" asked Zelinger. "Yeah," said Lacher. "That doesn't look like me because that's way too small from the way I do my loops and everything like that. That's not how I make my sevens, and if you look at this whole paper, there's a bunch of sevens that look all the same. It seems like all the sevens match, the sixes are the same, I don't know, you might want to look into this a little bit more." Six other voters also confirmed that their signatures were faked. Denver7 will hear back from the Secretary of State on Wednesday to find out if there's a method for you to call and find out if your name was signed on a petition. When a candidate for U.S. Senate petitions their way onto the ballot, they are required to collect 1,500 signatures from each of the state's seven Congressional Districts. The voters signing the petition must belong to the same political party as the candidate, in this case they must be registered Republicans. The voter signing the petition must list their address and that address must match the one on file with the Secretary of State's office. If that voter signs multiple petitions, the candidate who turns in their petition first gets credit for that signature. To collect signatures, candidate campaigns hire agencies that use individual signature collectors. Those signature collectors are typically hired for one or two months and either go door-to-door or stand in public areas asking for voters to sign their petitions. According to the Secretary of State, Maureen, the woman who collected the signatures in question, turned in 566 signatures. Of those, 488 were deemed valid. The 10 we have confirmed that are forged are from those 488. Denver7 attempted to find the Maureen, but she no longer lived at the home that was listed on her signature collector affidavit from mid-March. We called and went to the home of the person who hired the signature collector, but he was not home and has not returned our calls. We reached out to the Keyser campaign with a phone call and text to the spokesman, but as of Tuesday night at 11:45 p.m., he had not returned our call, text or tweets. On May 3, the Keyser campaign was not interested in talking about the first forged signature when contacted by Denver7. "It’s embarrassing for Senator Michael Bennet that he is so terrified of facing Jon Keyser in November he needs his sleazy liberal friends to pull such an ill-fated stunt," Keyser's communication director Matt Connelly said in an emailed statement. "I don't think this is a liberal stunt, I think it's backpedalling by the Keyser group to cover their tracks. They got caught and they're trying to cover it now," said Niemczyk. "Do you know who Jon Keyser is?" said Zelinger. "I do not," said Niemczyk. "Do you want to know who he is?" asked Zelinger. "I do. Probably not for the reasons Jon Keyser wants me to know who he is. I don't know how anyone could trust you after this," said Niemczyk. A few of the voters asked Denver7 what recourse they have for having their signatures forged. They can contact their District Attorney's Office directly. The DA's office has direct jurisdiction over these types of complaints. The Secretary of State's Office only verifies that the name and address on a petition are the same as what they have on record for that voter. There is no signature verification for the petition process. When we are proofing these, after they have been processed by our vendor, we concentrate on studying rejected sections and signatures to see whether those voters were properly excluded. The rules provide that a signature that is “substantially similar” to the name in the voter registration database will be accepted. Our office plans to examine whether signature review should be added to the requirements, recognizing that doing so would add both time and costs to the review. We also will be reviewing the deadlines in statute. This was the first time there were four statewide candidates who submitted signatures and only the third primary after the move to the June primary. Four years ago, only four candidates submitted petition signatures to make the ballot. This year, 20 did, including four U.S. Senate candidates, who were each required to turn in at least 10,500 valid voter signatures. Marshall Zelinger is a Peabody Award-winning journalist. He covers politics, breaking news and investigations for Denver7 and co-hosts Politics Unplugged on Sunday afternoons on Denver7. Follow him on Twitter and Facebook . Email your story tips to Marshall at Marshall@thedenverchannel.com .